Enjoy one of the world's most exciting New Year's celebration party. Celebrate the coming of the New Year in a city that knows how to throw a party, Rio de Janeiro. New Year's Eve in Rio is a doubly special event for in addition to the city wide celebration of the New Year culminating in fireworks up and down world famous Copacabana beach, New Year's Eve is a significant religious event for the Afro Brazilian religion of Macumba. 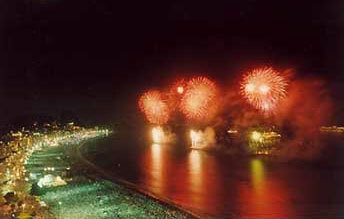 Night long festivities on the beaches, as celebrants give gifts to the sea goddess Macumba, make New Year's Eve in Rio unique. *Rates are per person based on double occupancy and include land arrangements, transfers and airfare from Miami. A charge of $165 covering U.S. Departure Tax, Customs, Federal Inspection Fees and other costs imposed by airlines and the Government is not included. Any applicable foreign departure taxes are not included. Land Only transfers are $50 per person, each way. Must stay overnight on Dec 31. Visa to Brazil is required for American passport holders, and must be issued prior to departure, fees are not included. Travel insurance is highly recommended and available for $135 per person.